This morning when I was out walking the dog, we passed a woman I’d seen at a wedding over the weekend. I don’t know her but I see her all the time, walking her dog or with her kids or out running. Always with her hair pulled back, a scrubbed-looking face, in jeans or running shorts or dog-walking gear like she had on this morning, a Labradoodle by her side. I can’t believe Microsoft Word doesn’t recognize Labradoodle. But at the wedding she was stunning. Simple dress, hair down, just a little makeup, luminous. I couldn’t place her at first, until my friend said, “You know her. She’s got the Doodle.” When we passed each other, the dogs sniffing in other directions, I said, “Now I know what you look like all glammed out.” I realized too late that it sounded creepy. Like I had something on her. All I meant was that I hadn’t realized how beautiful she was. But that’s also sort of creepy. Like, who cares? We don’t even know each other. The fruit trees in our yard got trimmed yesterday. We’ve been waiting and waiting for that to happen, because they were far too high, their spindly branches reaching well above the power lines that run along the back fence line in the alley. 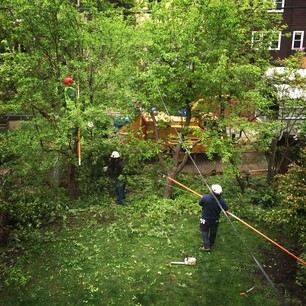 There were all sorts of delays, even after we’d booked the tree guys, because of ComEd and scheduling and weather. But finally yesterday, in all that wind, they came and reshaped them into the small dwarf fruit trees they were meant to be. I’ve always had a hard time saying dwarf. I’m still not sure which is right. Do you pronounce the “w” or not? Afterward I went out into the yard, expecting to bask in the glow of our newly proportional surroundings. Instead, the yard felt suddenly smaller and more bleak. The garbage cans in the alley seemed closer, crowding into view. The yard felt sad. “What happened?” I asked. “It’s supposed to look nicer now.” Dave didn’t answer. He was inside. It was freaking windy and cold outside. “It’s the same story,” I joked. “Really?” he looked at me seriously. “Yeah, I just have the one,” I said. I backed away before I could say anything else. Luckily Syd came in. I tried to talk to her normally but my nervousness kept twisting my tongue. She opened a shopping bag to show me a gift-wrapped box. “You get a goff?” I asked. It was loud enough that she didn’t seem to notice. “Yeah, I’ve been running errands,” she answered. Another friend walked up and remembered meeting Syd at our old book club. Syd said, “I’m going to see if I can find my book club book before it starts.” I didn’t want this friend to think we were excluding her from our no longer existent book club so I said, “Syd now in real bockup.” The friend smiled and went to her seat. A third friend showed up and gave me a peaceful incense talisman she got at a retreat over the weekend. I sniffed it a few times before I went up. And after I went up I wasn’t nervous anymore. wait. your story was great…his was a repeat. i think you pronounce the “g” in gnome, so the “w” in dwarf should be ok, right? i don’t think that was incense. book group? what book group? !